According to Code.org, 90 percent of parents in the U.S. want their children to learn computer science—it will be crucial for many jobs in the near future—but only 40 percent of schools teach it. Critics claim that it is mainly the more affluent schools that offer computer science courses, thus denying those who attend poorer schools the chance to learn necessary skills. A focus on STEM is not enough: Code.org also reports that while 70 percent of new STEM jobs are in computing, only 7 percent of STEM graduates are in computer science. It is imperative that savvy schools begin to focus some STEM resources on computer science and programming. In my opinion, parents of every student in every school at every level should demand that all students be taught how to code. They need this skill not because they’ll all go into it as a career—that isn’t realistic—but because it impacts every career in the 21st-century world. Any country recognizing that will benefit in the long term. With the following resources, you can teach programming to every student and every age. Tynker Games: Use these age-appropriate games to teach your elementary students coding concepts. From Puppy Adventures to Math Art and Maze Craze, you’ll find games that students in grades 1–8 will enjoy. Tynker also has a curriculum and STEM product library that you may want to peruse if you’re interested in combining programming with social studies, English, math, and science. Kodable started as an app targeted to students as young as kindergarten age, but it’s now a complete curriculum. The first 30 levels are free, more than enough for an hour of code. Kodable is recommended for ages 5 and up, but there are stories of kids even younger using the app with great success. 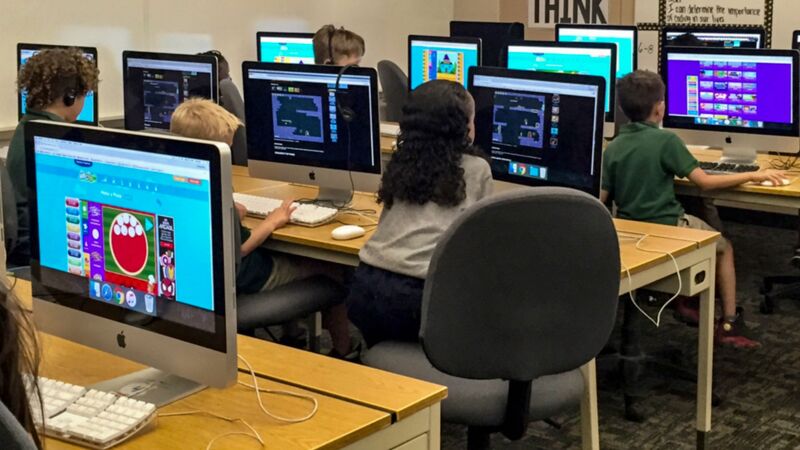 Students don’t need to know how to read in order to program using this game. Hopscotch is a free iPad app for upper elementary and above. Wesley Fryer has curated resources for Hopscotch in the classroom that are full of challenges that you can use with students. He also recommends activating the emoji keyboard (go to Settings > General > Keyboards) for use with the program. Lightbot is a puzzle game with a free version that lasts an hour and full versions for sale on iTunes and Google Play. It teaches planning, testing, debugging, procedures, and loops. Alice is a popular platform with a unique storytelling aspect. You can use it to create a game, tell a story, or make an animated video. Like Scratch, Alice is free and supported by a powerful community of educators. There are two versions of Alice. The newer 3.0 version still has a few bugs but sports many new, very cool animations. This long-standing platform is a rewarding tool that kids will want to keep using past the initial hour. Alice is considered more for the intermediate student, but experienced teachers can use it with beginners. Gamestar Mechanic offers a free version that you might want to use for your Hour of Code, but if you fall in love with it, the educational package allows teachers to track student progress, among other features. The company supports educators with videos and a must-see teacher’s guide. GameMaker: Studio is an option if you want to make games that can be played in any web browser. The resources aren’t as comprehensive as with some of the other tools here and the community isn’t vibrant, but this one has been around for a while and might be fun for a more tech-savvy teacher. CodeCombat is a multiplayer game that teaches coding. It’s free to play at the basic level, and students don’t have to sign up. It has the advantage that teachers don’t have to know computer science to empower learning in programming. It’s recommended for ages 9 and up. See the teacher guide for the information and standards covered in this game. Minecraft: Education Edition continues to be popular as the new owner of Minecraft, Microsoft, continues to collect and share best practices from classrooms. Code Monkey Island is a board game designed for children ages 9 and up. This is a great addition to your game corner. Check out the Hour of Code lesson plan tutorial from Khan Academy for ways to teach your students. These lessons are for older students with one computer each, but they can be adapted to a flipped class model. While the official Hour of Code is in December, see these resources for educators, unplugged lessons (no computer required), and tutorials to help you teach computer science to kids of all ages at any time of the year. Programming, making, and creating have never been easier. If you’re getting into the maker movement or Genius Hour, these should be staples in your classroom. While they may take longer than an hour to code, they’re definitely something 21st-century schools can use, because students are programming and building with their hands. Lego Mindstorms are part of my curriculum every spring. Students love Legos! I have six older kits that we’ve used for years. The newer NXT kits have cool robots that can be made and programmed. This product has been around for years, so there are many resources for teachers. If you purchase an older kit on eBay, make sure it will work with newer operating systems. Dash and Dot are two endearing little robots that can be used with ages 5 and up. These robots have apps that can be used to program them, for which children ages 8 and up can use Blockly, the visual programming language created by Google. Older students can use Objective C or Java to program the bots. Sphero and Ollie are fantastic robots that can go almost anywhere (my students have taken them across water). The SPRK education program gives teachers and parents a curriculum for using the bots and teaching programming even while the adult is still learning. Please join the movement to help reach every child by sharing in the comments section your story or a link to your favorite resources for teaching kids to code.